Today I was assigned to do a story about Manette artist Marnie Holt Swenson, whose gift of an oil portrait of the first family was recently acknowledged by President Barack Obama. As it turns out giving gifts to the president is a complicated process, and in the case of gifts from foreign dignitaries, it involves a lot of protocol. In fact there’s a whole department dedicated to screening, accepting, acknowledging and reciprocating gifts to the president and other employees of the executive branch from foreign officials. The State Department’s Protocol Gift Unit must document every gift, no matter how small. Data from 2009, Obama’s first year in the White House, has not yet been compiled. Records show some of the more offbeat items received by his predecessor, George W. Bush, include a black Mercedes mountain bike from German Chancellor Angela Merkel, a shoe shine kit and CD, “Spirit of the Bush,” from the Governor General of Australia, and the book “1,001 Reasons to Love America” from the Sultan of Brunei. I understand a Maine microbrewer called “Bill the Beer Guy” has donated a basket of his wares to Obama. Wonder what the secret service will do with that. As it turns out, in some cases, they really shouldn’t have. According to the blog, the President of Indonesia, thoughtfully, donated to President George H.W. 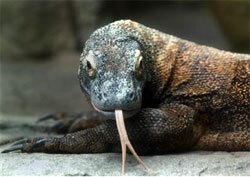 Bush a Komodo dragon. “Perhaps worried that the venomous, flesh-eating lizard wouldn’t play nice with First Dog Millie, Bush donated the dragon, named Naga, to the Cincinnati Zoo & Botanical Garden,” the blog says. And talk about gifts that may have missed the mark by a hair, the president of Azerbaijan gave Clinton a carpet that was a portrait of the president and first lady Hillary Clinton. 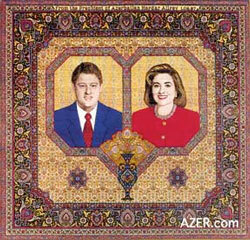 The carpet shows the first couple inside a heart-shaped medallion. “I wanted to convey their lives as one beating heart,” the artist said.